"What is vivid in memory is the singular, striking, one-of-a-kind event or episode, encapsulated as if in amber.... not routine but what violates routine. Which is why the effort of writing a memoir is so fraught with peril, and even its small successes ringed by melancholy. The fact is - We have forgotten most of our lives. All of our landscapes are soon lost in time." 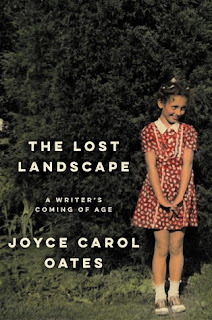 The Lost Landscape by Joyce Carol Oates is a very highly recommended collection of 28 pieces about her childhood, to adulthood and shares some of the incidents that have shaped her as a writer. 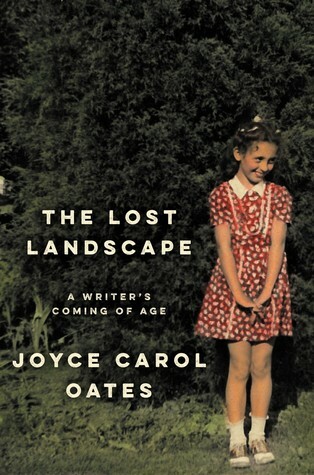 Many of these stories have appeared in other publications and have been revised for this collection of the landscapes that have shaped her career as a writer. They are little vignettes of time caught in amber rather than a complete story of her life. Oates grew up in an impoverished area of rural western New York State on her family's farm. Young Joyce had a special red hen, Happy Chicken, who was her beloved pet. She went to the same one room school house her mother did as a child and went on to attend high school in Buffalo. She was then a scholarship girl at Syracuse University and went on to get her masters at the University of Wisconsin. She shares her bouts with insomnia, first experiences with death, a friend's suicide, another's sexual abuse, as well as some of the stories that inspired her to write several of her novels. She has a moving piece about her autistic sister. 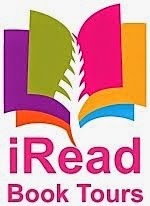 There were several things she described in these stories that brought vivid memories of my life to the forefront. I remember my grandparent's breakable, fragile Christmas ornaments that also included strings of bubble lights that fascinated all of us grandchildren. On her step-grandparents farm there is a pear orchard that she describes: "On the trees, the pears were greeny-hard as rocks for weeks as if reluctant to ripen; then, overnight, the pears were “ripe” - very soon “over-ripe” - fallen to the ground, buzzing with flies and bees." I remember a house we lived in when I was young, before attending school, that had a backyard filled with pear trees. Her descriptions vividly brought to mind the danger those pears represented, when they were over ripe, on the ground, and all sorts of wasps and bees and insects were swarming the area. Obviously these pieces are extraordinarily well written, with details lovingly, gently, carefully describing specific events and memories. She shares some hurtful events too, although carefully modulated by time. Her parents are lovingly and warmly described creating a tribute to their memory. This is an excellent collection of pieces for a memoir.